On one hand, I guess this is no different from selling beads as supplies that were bought from another local bead shop. And maybe these supplies will be useful to people from other parts of the world who do not have access to such items. However, on the other extreme, it can also mean that I can basically resell anything commercially made stationary that will can be use for crafting. This even include pencils, erasers, tapes, letterpads, notepads etc. Hmm.. I am torn.. what do you think? On the other hand, congrats on making something that others think will be in demand. humm that is a little fishy kinda sounds a little ebay like to me lol but I see what you mean how much different is it from selling scrapbook paper or beads..... humm good words for thought there. SleightGirl - Well, if these stuff were made by me and someone try to resell it, then it would be more of infringement of copyright I supposed.. but these items are more of commercial supplies that you get at a chain store e.g. 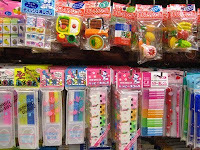 Walmart.. in this case it was Daiso..
ItsyBitsyBracelets - Ya.. totally something to think about..I supposed :) Oh well..
yea i have come across shops that sell nothing but these types of "supplies" and i guess yes artists use erasers - but i doubt they use cute little froggy erasors. seems kind of like a loophole to me too. but if etsy allows it they have a right to be there too. Hmmmm.... I've wondered about this kind of thing myself. As long as the commercial supply item is 'special' in some way, like I can't just go to the Yen Shop or it is generally not readily available, I think it's ok. Also I think breaking up large amounts of supplies into smaller sized quantities is fair. All this as long as you don't claim to manufacture any of it. If there is a market then it will sell, if not or the price is not deemed reasonable then it won't. As for re-selling someone's personal product that should not be done without permission. hmmmm...i would feel a little funny about that too. i've seen stamps that sell in my local Michael's for $1.00 being sold as supplies for $2 or $3. It gives me a bad feeling???? ANYTHING could technically be used as a "supply" in someone's artwork. I think this loophole on Etsy SHOULD be addressed, but I'm sure it won't be anytime soon. I'm thinking that's a little fishy. But then again, what about supplies like jump rings, eye pins, ect?....I think it depends on the item.